Don’t choose between happy or healthy. 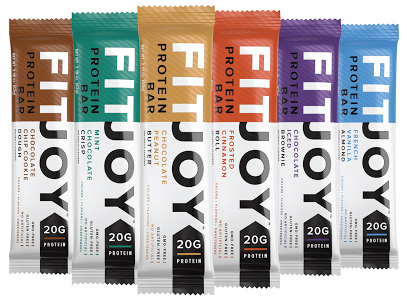 Not only do FitJoy protein bars taste amazing, they’re also nutritious and healthy. Each bar has 20g of protein, NO GMOs, NO Gluten, NO Artificial Colors, Flavors or Sweeteners, NO Sucralose, NO Artificial Preservatives. Just real goodness and really indulgent flavor that you’ll enjoy. You shouldn’t have to choose between healthy and happy. But far too often, we choose a side whether we realize it or not. Eating right, working out and making steps towards your goal should be a journey that gives you more satisfaction, not less. Put the joy back into living a healthy lifestyle with FitJoy! Counting down the months to your next birthday? Not to worry! 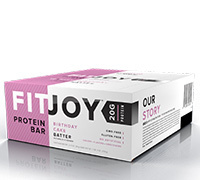 With the FitJoy Birthday Cake Batter Protein Bar, you can celebrate every day like it’s your birthday (minus the balloons)! Delicate and dough-like, the bar’s texture combined with a blanket of sweet, creamy coating creates a melt-in-your-mouth experience. If that isn’t exciting enough, each bite is decorated with rainbow sprinkles for a little extra fun, surprise and delight. And the absolute best part about this bar? It won’t overload you with sugar, fat and empty calories. So go ahead and celebrate. You don’t need a reason! This bar will fuel your body and satisfy your sweet tooth–no spoon necessary. Dairy Protein Blend [Whey Protein isolate, Milk Protein Isolate, Whey Protein Crisps (Whey Protein Isolate, Why Protein Concentrate, Tapioca Starch, Calcium Carbonate, Sunflower Lecithin)], Yogurt Flavored Coating [Milk Protein Concentrate, Palm Kernal Oil, Erythritol, Yogurt Powder (Whey Protein Concentrate, Nonfat Dry Milk, Yogurt Cultures), Sugar, Soy Lecithin, Natural Flavor], VitaFiber™ (Isomalto-Oligosaccharides), Vegetable Glycerin, Water, High Oleic Sunflower Oil (with Citric Acide to protect flavor), Chicory Root Fiber, Natural Flavor, Maltodextrin, Butter (Cream, Salt), Sprinkles [Gum Arabic, Colored With (Beta Carotene, Radish Extract, Spirulina Extract, Turmeric), Citric Acid, Safflower Oil, Vitamin E (antioxidant)], Sunflower Lecithin, Salt, Stevia. Note: Values may be slightly different depending on the flavour.